With two weeks to go until the one-year anniversary of the public launch of iTunes Match in the United States, Apple is sending out emails reminding user who have opted for auto-renewal that their credit cards will be charged the next $24.99 annual fee on November 14. Continue to enjoy your entire music collection in iCloud on your iOS devices, iTunes, and Apple TV. iTunes Match stores not only your songs purchased on the iTunes Store, but all of the other great music you have acquired over the years, including music from CDs. 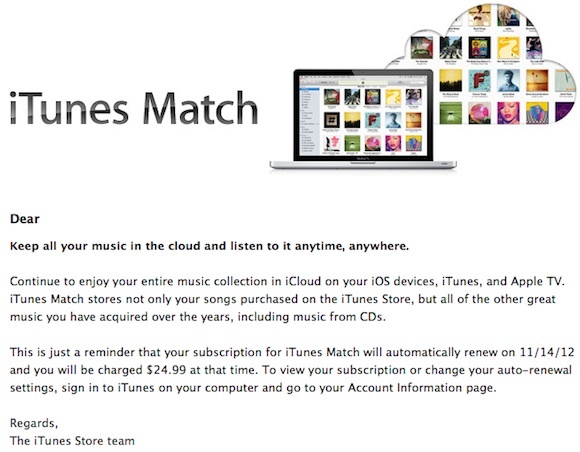 This is just a reminder that your subscription for iTunes Match will automatically renew on 11/14/12 and you will be charged $24.99 at that time. To view your subscription or change your auto-renewal settings, sign in to iTunes on your computer and go to your Account Information page. Additional information on subscribing to iTunes Match or turning off auto-renewal is available in an Apple support document. With as much trouble as I had with it, I don't think I'll be renewing. Apple should be giving a free 6 months to people. It wasn't as if iTunes mis-match was problem free. Frankly it's screwed up my library (wrt to explicit songs being matched incorrectly) and cost me a lot of time. BREAKING: Apple sends bill reminders a year after people sign up to yearly service. For as much as I love Match, I just wish it matched available music a lot better than it currently does. Blows having 13 out of 14 matched from the same single CD album, with the 14th being unrecognized. too bad it was for 25,000 or less songs. And for what it is worth, if I've wanted a song/album, i try and remember when I am at home and boom have it the next day. so $25 saved. "News and rumors you care about"
I imagine the only people that 'care about' this are iTunes Match subscribers. And they'll be getting the email. Really don't see why this is on the front page. It's a holiday. Halloween for kids, Reformation Day for Puritans, iTunes Match Renewal for Apple fans. Really don't want to eat up my own cellular data plan listening to my own music which I have now just paid to store online. Pass.